Commissioned by Pacific Links International, Tiger Woods and Gil Hanse, together with the natural beauty of the Mākaha Valley, we will create one of golf’s finest and most sought-after golf destinations. Toronto, ON (April 3, 2019) - Golfing icon Tiger Woods and his TGR Design company have today been unveiled as lead architects for one of two spectacular golfing layouts to be created at Mākaha Valley Resort, Hawaii, a project commissioned by Pacific Links International, the world’s premier golfing network. 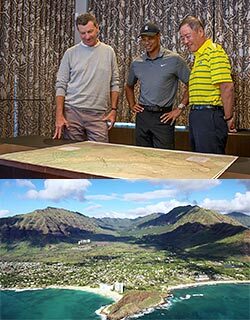 Inspired by the pristine setting on Oahu’s Leeward Coast, TGR Design will lead the development of the Mākaha North Course, while Gil Hanse, creator of the Olympic Course in Rio de Janeiro, will develop the Mākaha South Course. Together, these world-class, tournament-quality layouts will become the centre pieces of the Mākaha Valley Resort, a 644-acre mixed-use property developed in conjunction with community leaders and native cultural practitioners on Hawaii’s third-largest island. “With the sloping nature of the land, several natural washes, and a few significant elevation changes to work with, we know that the course will have a great deal of variety and will flow wonderfully across the topography. Combining those natural advantages with a style that will be based on the great California courses designed by George Thomas (Riviera, BelAir, and The Los Angeles Country Club) should yield an interesting and thoughtful course to play and a spectacular one to look at. Pacific Links International has created the world’s most comprehensive reciprocal golf course network and serves as the golf industry’s leading portal to the avid, travelling Chinese golfer. Pacific Links provides its Asia-based International Members with a premium golf experience through an innovative international membership structure. Pacific Links offers them access to the finest collection of high-quality golf clubs in the world. Since 2012, the Pacific Links network of Affiliated and Reciprocal clubs has grown to over 400 properties located in 37 countries around the world. The Pacific Links golf network serves over 16,000 members based in Asia, as well as an aggregated population of over 125,000 network golfers from participating network clubs. The main feature of a Pacific Links partnership for participating Network Clubs is the opportunity to offer reciprocal or affiliate access to other destinations across the Pacific Links International Network to their own members. The Mākaha Valley Resort will be part of a mixed-use development including a golf club, an arts and community center, and a health and wellness center in phase one, and timeshare, golf villas, and multi-family residential units in phase two. The entire mixed-use development will be improved on approximately 128 acres of land flanked by two golf courses, to the north and south sides. At the center of the entire master plan development is the Piko, a Hawaiian word for center, the point from which the guest can access the welcome and reception areas, health center, restaurants, guestrooms, and entertainment and cultural components. The resort will reflect the elements of the surrounding valley with a focus on authentic Hawaiian culture, watershed restoration, ocean resource management, golf, sustainable development, food management, energy and waste management, education, and long-term water resource management; in essence, the stewardship of an Ahupua’a—a self-sustaining unit of land divided and shaped by the natural geography of the valley. The Mākaha Valley Ahupua‘a follows the natural watershed boundaries formed by the uplands from Mt. Ka‘ala, the highest peak on O’ahu, to the fertile valley floor and extends out to the ocean. The Mākaha Valley Ahupua’a will replicate the ancient Hawaiian communal system where community needs are met utilizing the resources found within Mākaha. The hotel and timeshare units will be arranged in the central core of the valley with landscaping featuring hiking trails surrounded by valley vegetation leading to several points of interest in the valley, one of which is the Käne‘äkï Heiau, an ancient Hawaiian temple site built in the 17th century. The resort will blend with the natural surroundings and a network of paved paths and trails throughout the site will provide access to the resort units and guest amenities.